Beginning piano students have a lot to think about: note reading, rhythm, coordination, posture… their brains are busy! It is therefore easy to get caught up in the mechanics of learning a piece and leave the “polishing” until the bare bones of the piece is mastered. We don’t want to overwhelm beginning students. 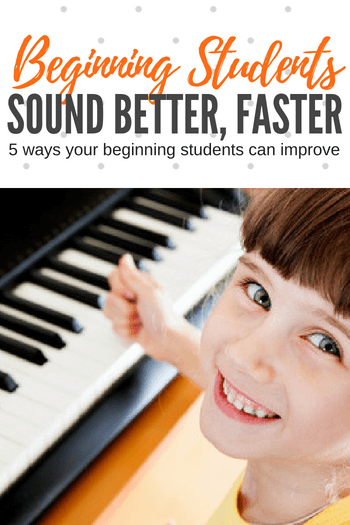 But there are certain technical abilities that, if learned early and often, will help your beginning piano students minimize the “slow slog” and get on with the “spit and polish”. But rather than confuse and frustrate your students as they pick their way through their pieces, be sure to work on these 5 technical abilities alongside their regular repertoire and watch magic happen! My Top 5 Favorite Technical Abilities for Beginning Students are below. I’d love to hear your favorites in the comments section at the bottom of the post! 1. Staccato vs. legato abilities – Students who can effectively and consistently show a difference between staccato and legato immediately lend a sense of artistry to their playing. Teaching your beginning students how to play with a beautiful sense of legato and to pay attention to all staccato markings (even those “often-forgotten” ones at the end of a phrase or the last in a set of repeating notes) does wonders for their artistry. Try This: Seek out short passages of music from a technical book or from their method book that do not require too much in the way of note reading, but that require attention to legato vs. staccato. Give your piano students lots of opportunities to practice staccatos at the end of phrases, two-note slurs, staccato and legato stepping and skipping, staccato chords… all of the different scenarios they will encounter within their pieces, but in a pared-down setting. 2. Dynamic range – Students who have mezzo piano and mezzo forte in their repertoire of dynamics (instead of simply piano and forte), and students who can effectively execute a crescendo and a diminuendo are then able to add more interest and color to their playing. Try This: Speak of the dynamics in their piece even before any other learning takes place. Sometimes dynamics are added into a piece as an afterthought once all of the other elements are up to snuff, but if you give dynamics the significance they deserve instead of adding them after, your piano students will learn to see that they are important and worthy of attention (always!) Introduce dynamics as a way of telling a story with music – so give your students a reason for the differences between mezzo forte and forte and mezzo piano and piano (What could be happening in a story that went along with their piece? How is the change in dynamics related to what is happening in the music?). Include crescendos and diminuendos in their technical work and scales to give your students the opportunity to experiment with hand weight and control. 3. Rhythmic Accuracy – Obviously we all teach our piano students to play with correct rhythm, but we also want this correct rhythm to happen within an overall framework of a steady pulse. Students may hold a half note for two beats, but if those two beats are not exactly within an underlying pulse, then their rhythmic accuracy is not what it could be. The ability to keep a steady tempo and to have rhythmic accuracy within this tempo sets students apart in leaps and bounds. Try This: Using a metronome is the obvious suggestion, but teaching your student to hear the underlying beat themselves without a metronome is also important. Spend time listening and moving to music together. Teach your students how to clap along with the beat (and try to find more than just one way to clap along to increase their rhythmic abilities). Singing the melody line together as your student taps a steady beat on his lap is another way of training his ears to hear a steady tempo. 4. Articulation Awareness – Beginning students typically only see staccato, legato and fermatas for the first bit, but I like to add in accents and tenuto markings even before the method books introduce them. Kids like the drama that these add to their music, and I like the way it contributes to their awareness as they play. Having a wide repertoire of various ways to strike a key means your students are making significant connections between what they see on their page vs. what sounds their fingers make. Nothing but good things come of this! Try This: Add your own articulation markings to even your beginning students’ music sometimes. Make these decisions together with your student (“What note would sound good with accented?” or “What marking would we put on this note if we wanted to pause here?”). Allowing your students to assist with the decisions gives them a sense of ownership over their learning and means that they will definitely pay attention to what’s on their page. Looking for a resource that will have your kids begging (that’s right, we said it!) to do their technical exercises? TEDDtales, our interactive, story-based approach to technical exercises, gives teachers the material they need to focus on specific technical abilities with the fun that kids crave! 5. We want to hear from you! What is your favourite technical ability to focus on with your beginning students? Share in the comments below. We all want to produce piano students who enjoy what they play, and a lot of enjoyment comes from playing well. Even very young children will rise to the occasion if you provide these challenges within their beginning pieces. Starting with good technical habits (no matter how simple) will mean your students will be one step ahead of the game. If their eyes are used to noticing the technical aspects of a piece, and if their fingers are used to responding accordingly, as they enter more advanced repertoire all of the groundwork has already been done. Beauty and satisfaction await!